Those were the words I dreaded, but they were inevitable. And before I could even finish one complete dramatic eyeroll, she had whipped out a tiny little notepad from her purse, and she was sketching away like a fashion designer (long before the days of camera phones), and we would head to the fabric store. And then I would end up with a homemade article of clothing. Yes, it would look just like that thing that I had wanted. (Actually, better, most of the time, because it was customized just for me, according to my taste.) But it was homemade. And that’s not what I had wanted. As a kid, I had no appreciation whatsoever for the time, effort, skill, and craftsmanship that went into homemade custom items like that. I just wanted the inferior quality off-the-rack stuff. Little did I know that I would not only become my mom, but I would become her to the extreme. And now, I am so incredibly thankful that my mom instilled in me not only a desire to spend money wisely and not throw money at things simply because of a brand name on the label, but she also created in me a love for creating things with my own hands, and a creative eye that can spot things that I love but that I can create myself for less (and often — but not always — with better craftsmanship than the original). So I thought I’d give you a glimpse into how my mind works when it comes to DIY. And one of my favorite games to play is called I Could TOTALLY Make That! I like to peruse online stores (my favorites being Pottery Barn, Restoration Hardware, Anthropologie, Ballard Designs, West Elm, Layla Grayce, One Kings Lane, and Joss & Main), and challenge myself to come up with ways to make as many of the things I like as possible. I have an entire file on my computer of I Could TOTALLY Make That! items that I hope to try out one day. So here are a few, and I’ll show you how the process works in my mind. Let’s start with this light from One King’s Lane. I don’t like the inside part, but I do like the outside “cage”, and I would love to adapt this idea for my house. Perhaps a light for my kitchen? Now obviously this light is made from metal. First and foremost, I know my limitations, and I don’t have any skills whatsoever with cutting, forming, and welding metal. But I can work with wood. 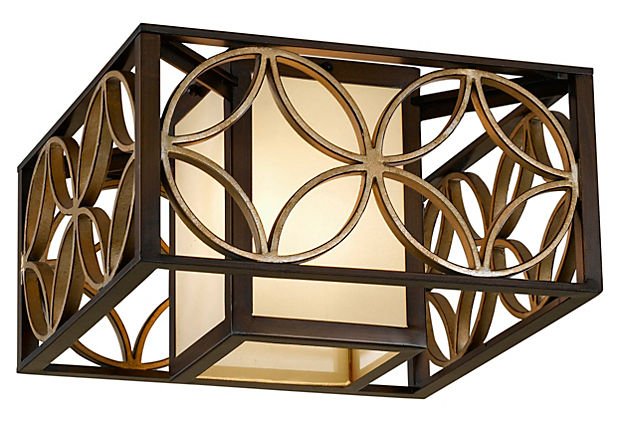 So I ask myself, “What’s made of wood and looks like the parts required for this light?” The answer? Square dowel rods and embroidery hoops. Square dowel rods (available at Home Depot) to make the basic frame, and embroidery hoops (available at a Hobby Lobby) to make the circle design. Use a miter saw to cut all the pieces, attach them with tiny finishing nails, or perhaps even just wood glue or a quick-setting epoxy, spray paint the whole thing black, use gold leaf on the circle design, and done! I could seriously spend hours doing this! Okay, next. These Xavier Hurricanes from Pottery Barn. These are so easy! The potentially expensive part of this would be the glass. So what has glass that I could use? Super cheap clearance frames! I’d grab four of them just for the glass. Then I’d make the hurricanes to fit the glass I found. Make the basic frame out of square dowel rods, bottom out of MDF, decorative base out of square dowels, and the “X” design out of small trim from Home Depot. 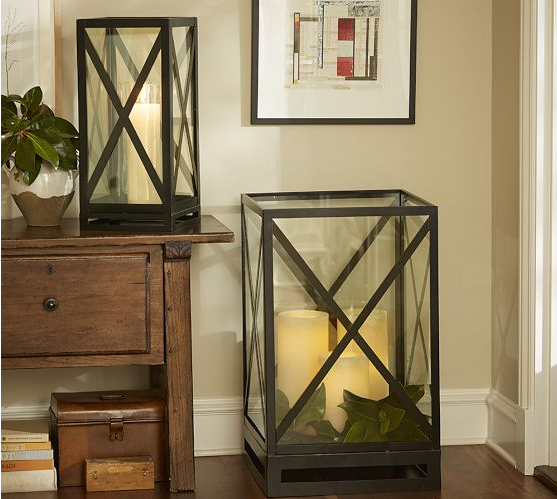 Paint it black, adhere the glass to the inside, plop in an battery-powered candle, and done! Next, this teak end table from Joss & Main. Making round items an be a challenge, but for something like this, Home Depot just happens to have the perfect thing! I would start with a round cardboard concrete form (the kind used to pour round concrete footings or pillars.) Cut a round piece of MDF for the top, and then start cutting and adhering short pieces of 1″ x 2″ lumber to the top to give the appearance of a solid bundle of wood. Once the top is covered, cut longer pieces to completely cover the sides. Cut some little feet and attach those (or come up with something that looks better than those). With the whole thing assembled, give it a vinegar and steel wood treatment to age the wood, seal with water-based poly, and done! I seriously love this game! And I’m not lying when I say that I do this quite often. It keeps my mind thinking creatively, and challenges me to think outside the box. Next, this Piana Mirror from Joss & Main. 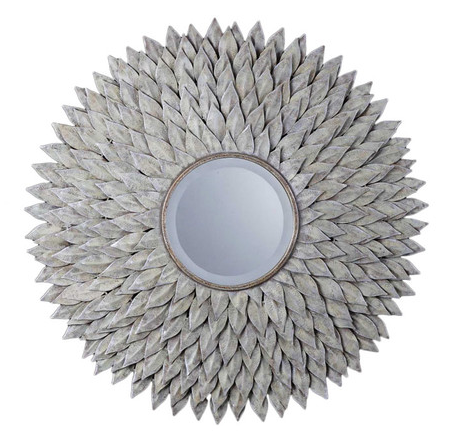 It’s very similar to my chrysanthemum mirror, but has pointy petals, and there are a lot more of them! Plus, it’s made of metal. Metal items can also be a challenge, so I have to think through what’s already available out there, and easy to use. I’d grab a roll of metal flashing from Home Depot, along with a pair of tin snips and thick gloves, and start cutting petals! Crease each petal down the middle to give some dimension, glue them around a round piece of MDF, give the whole thing a coat of gray spray paint, followed by a very light dusting of various other colors (white, metallics, etc. ), glue a mirror the the center, and done! Something like this is obviously more challenging, as it’s more than just a pretty accessory, but an actual piece of furniture. Since I don’t own a lathe (and even if I did, wood turning is a craft that takes years of practice), I’d purchase some ready made legs from a place like TableLegs.com. 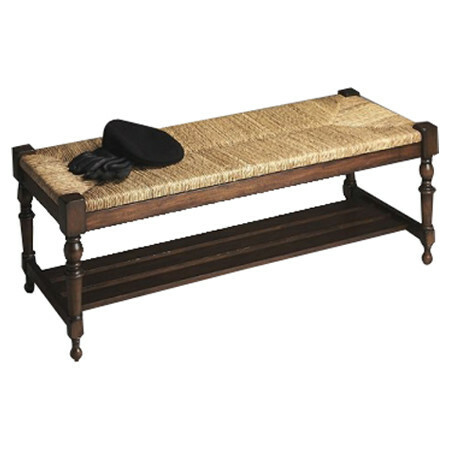 Then I’d build the base similar to the one I built for the upholstered ottoman coffee table. Building projects are made much easier for DIYers if you have a Kreg Jig. The top would be the most challenging, but after studying it, I don’t think it would be difficult. Time-consuming, yes. Difficult, no. I’d build a frame, and then buy several spools of a natural twine (like a jute twine) from Home Depot. I’d wind it around the frame, pulling very tightly, and completely covering the frame from side to side going in one direction. Then I’d start winding it the other direction to cover the other two sides, and weaving in and out of the twine that goes in the opposite direction to create the design. Again, very time-consuming, but not difficult. Make sure all of the twine is secure (I’d probably reinforce them with lots of staples and/or a strong adhesive on the inside edges of the frame), and then drop the frame into place and secure it to the base. 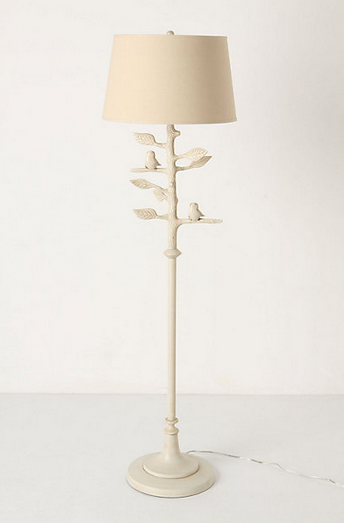 And one more…this Sibley Floor Lamp from Anthropologie. I’ve wanted to make something like this in a table lamp version for quite some time. Obviously I don’t have a way of making something from metal, so what could I form into a shape like this? Clay! I would start with a long threaded lamp rod and build a very basic table lamp with the threaded rod as the base of the lamp so that a cord could be threaded up through it. Then I would use some medium-gauge wire and wrap around the threaded rod base to form the very basic leaf designs. (It wouldn’t actually look like leaves, but it would form a rigid “spine” for my leaves. And then I would use air-dry clay to sculpt the branch and leaves over the threaded rod and the wire form. Let it dry, add a bird or two (probably something purchased from Hobby Lobby or somewhere like that) and attach with adhesive. Spray the whole thing in one solid color, add a shade a bulb, and done! I have this idea that once my house is finished (ha! as if that’s going to happen!) then I’ll turn my blog into a “How would you make this?” blog, where people can send me pictures of thing they’ve seen in stores or magazines, and I’ll recreate them on a budget. That would be so much fun!! I absolutely love this post, and your creativity! I am like your Mom, so far as the sewing thing goes….look at it and make it cheaper. You have inspired me to try my hand at other things…I have a few little tables, I want to do over….. Thanks! We think very much alike, but the big difference is you can actually DO these things! I just dream about them!) Keep inspiring the rest of us to be CREATIVE! Oh, and it was my grandmother who sewed for all of us – and taught me as well. It skipped a generation, but because my mom was very tall my grandma would end up making a lot of her clothes. Same for me! brilliant! I’m still searching for the right DIY headboard project. Now i know what to do. What a wonderful post. I sewed for my daughters when they were young. I imagine they hated it too. Except when I made them a cool halloween costume!! I love the way your brsin works! And if you ever start work on the woven bench, here is a heads up. I have done woven chair seats similar to the bench and a couple pieces of cardboard (the corregated kind) inserted between the rows of woven material works to beef up the seating area. The mirror idea I saw something on trusper where they used plastic forks to do a similar mirror you could paint the plastic to look like metal. Thanks for sharing how your creative mind works—you are an amazingly generous women, not only giving us great DIY ideas everyday, but also teaching us how you do it. You are my favorite blogger and I love your blog. Have you ever thought of writing a book? I would buy it in a heartbeat! Same here! I was planning to send her an email begging her to write a book. Knowing her she is already looking at how to do it cheaply for herself and us the followers. Waiting on the ebook Kristie! come on and give it us and I’m sending it to Oprah! you could be on OWN with a realty show! What would I do without you??!! You are (I have to find a new word to describe you) AMAZING! And I learn so much from you and your thoughtful, well written posts. Thank you, thank you, thank you!! I second the book idea! Take all of your projects and your directions for them and publish it! I’ve done something similar all my life – I’d see a room that I really loved and analyze the furniture arrangement, the color scheme, and the combination of styles in the room and then go to thrift stores, garage sales, and flea markets to find ‘gently used’ items that I could convert or recover or build myself to copy those elements of the room. Of course, my rooms were never exactly like the inspiration rooms because my family’s needs were different, but I learned a lot from the exercise, not to mention saving tons of money! As to the sewing, yes, I too sewed many of my children’s clothes when they were younger, but once I discovered garage sales and realized that I could buy perfectly good, even designer clothes for less than it would cost me for the fabric and pattern, I began doing that. Loved going early on Saturday mornings to garage sales! Many, many items in my home are garage sale finds as well. A coat of paint, a simple repair, or just use them as is. I don’t have your skill and expertise with power tools, and that is one reason I admire what you do so much. I look forward to each blog post to see what’s going on in Kristi’s World. You truly are an inspiration. WOW!!! You really do think outside the box…. so talented ,LOVE IT!!! My mom made all our clothes when we were growing up (5 girls! ), but somehow managed to get us to think we were wearing designer originals, NOT homemade! Probably came from perusing the Vogue Pattern books. So now, I’m my mom! Thanks, Mom! I also think outside the box! My husband never knows what he will come home too. I love making stuff out of things I have around the house. Do you have your ideas on a Pinterest board? Ya got MAD SKILLZ girl! MAd! Holy gorganzola cheese Batman! You are giving me the bug to dip my toe in the DIY arena. I’m creative, but not on the same scale… but you got the Skillz (yes- the “z” was added for drama) Yes- I do the same thing, but never had a garage until now. 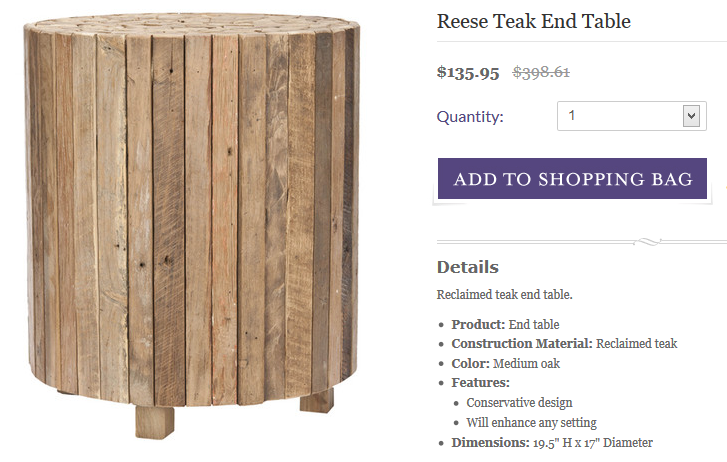 I’m digging that adorable little round table with the wood bits. (rubbing hands together diabolically) MWah ha ha ha ah… ha ha ha ha… how do I cart all that crap home in my little Xb? Oh and now I live in a much much much smaller town- my experiences at both HD and Lowe’s have been AMAZING! I didn’t know they had employees that actually help you with stuff. (seriously- not trying to be sarcastic) NOW I understand why ya’ll DIY’ers go there so often. Had I had a better experience in previous town… who knows what would have progressed. Me toooo! I grew up like that and I was laughing at your post! My Mom also made some of our clothes, and our rooms were done DIY, but mine went to the extreme and made us McDonald’s at home… UGH! I hated all of that too, but now, I sit at my Mom’s Kitchen table with her (with our coffee, or wine!) and we plow through catalogs (all of the big boys) and turn down the pages on the items we think we could make ourselves and exclaim at the prices and how much we could save! LOL! The joss and main stool could also be made with rulers. Love the home depot form idea. Love, love your game! Love it! I would find a floor lamp at a thrift store and add the leaves and birds from that point; but I never would have thought to use wire and clay. I love everything you do!!! Apparently, we were raised by twins. My mother would do/say exactly the same things only in an EXTREMELY loud voice, as I wished myself to slowly disappear into a sinkhole. And, like others have said, I turned into her (minus the embarrassingly loud voice, I hope). My 22-year old daughter at least appreciates what I can do and routinely sends me requests to copy her latest fashion favorites. Right now it’s Lilly Pulitzer–those prices are ridiculous! Love your ideas and inspirations !! I snap a reference pic and often make us stop in to places like Home Depot, Ace, Michaels, etc and get the stuff. Or do the same as you online & save pics… some of my faves are West Elm and for freak-your-hair-off prices, Wisteria. What a great post. Using your mind like that keeps it young, too! Sometimes it’s cheaper to purchase an item but the satisfaction of making something is really worth it. PS. I REALLY want to see you make that birdie lamp. Cuteness! Yes my mind works similarly. But my problem with a full time job is actually finding time to make the stuff. If blogs had been invented when I was younger I would have been a full time blogger doing diy as my life work. You are fortunate to be able to do something you love. Oh and also I can get caught up reading blogs when I could be making something. Yes! Finish your house(s) and then start pumping out these projects, just like you already do. Great idea. This has to be my all time favorite of your blogs. I totally so admire you for what you do. And you seem to have so much fun with it. As for the sewing your mother did….that was my life also and I never appreciated what she did to make me those drop dead outfits. When I was a junior in high school I subscribed to Seventeen Magazine. I saw a dress I wanted for the prom….my mother looked at it and said we would go shopping for the fabrics..we did…the night of the prom when I ran into my brother and his date…who was a senior…she had on THE dress from Seventeen Magazine…hundreds of dollars…mine was less than $50.00 for everything…even the hoop petticoat and pantilets which at that time were the rage (the 60s)…Mine was 20 times prettier and even she admitted it…she was stunned…and I was over joyed…So Mom…thanks! And thanks to all the Moms who loved us enough to do all that work for us…Right Kristi? Thank you for allowing us into your thought process for projects. I admit, I am someone who was wondering how you come up with your ideas. I’m glad to know where you get your inspiration too. Great idea to write about this topic. ALSO…..WHAT IS THE VINEGAR AND STEEL WOOL PROCESS YOU REFERRED TO? CAN YOU EXPLAIN IT? THANKS! Kristi has blogged about this. Look under My DYI Projects – Accent Furniture. for a blog titled Coffee Table Makeover with Vinegar Stained Top. Kristi, there is a serious possibility we may be related. Not only was I already envisioning how I could make each of the items you pictured here before I even read your text, but I have my own file of projects I can and will make myself. My favorite one. ..Years ago and before YouTube, I saw a gorgeous copper pot rack with intricate filigree designs at a super gorgeous price of $1,000. Immediately, I thought I could do it myself, even though I had never worked with copper before. I went to Home Depot, asked questions, learned about solder and knee joints, and made a pot rack even better than the one I had seen, with a price tag 1/10 th of the store bought one. It is a prized piece. You understand why. Great info. A couple of these I think I might be able to do. I won’t know until I try. Thanks for sharing and love your blog. Love the way you think……….and how your thinking actually materializes! That is how I sew- I am glad you learned from your Mom and have inspired me out of my fabric world a bit. You truly have a gift. I can, paint, refinish, stripe, and plaster. I have redone and decorated many spaces. But I’ve never looked at any item I could buy and think I could make it. However you have open my eyes now. Cheers. great post, my husband always says i don’t buy things when i go shopping, i buy projects for myself. only thing is, there is only so much time to do all these projects and sometimes i have to know my limitations. like would it kill me to buy premade pillows or curtains just once. Another home run. I LOVE this kind of stuff. I’ve pinned several of these photos to one of my Pinterest boards. I see a book with all your “inspired” homemade projects – this theme is especially intriguing to me. You are an amazing, super talented artist. I guess it is in your genes. The new blog sounds like an excellent idea but I still would rather you just come over to my house:)right now I so want to have cornices made from crown moulding. Keep those ideas coming. Yours is always the first email that I open. I love,love,love reading about all the things you do.My Momma was like that.Her and a neighbor would trade furniture,a lot of times paint or rebuilding it.She gave one her dinette set for a big huge dresser, she took the drawers out ,added baskets and used it like we now would for a kitchen island.My poor daddy never knew what he was coming home to.He use to say if she was the caretaker of a cemetary she’d rearrange the tombstones.She was probably the inventor of textured paint (back in the late 60’s early 70’s.) She mixed corn meal with flat paint and painted the dining room! Yes the neighbors thought she was a little bit weird at the time,but I bet now they wish they had paid attention to some of the things she did! I could play this game for hours, great post Kristi! Love the way you think! I have one…just one…that I’m still trying to figure out after almost 2 years (Focault’s Iron Orb Chandelier at Restoration Hardware). Don’t want to use embroidery hoops. Have a candelabra to use for the actual lights. Still looking for the “right” stuff for the orb. Hopefully I will have a light bulb moment before too long! You could use some thin flat metal pieces, but you would need to find a welder or to solder them in order to attach them in position. This is soooo awesome. I’ve already been doing this a little since reading your blog but now the possibilities seem endless. Thank You! I love your blog!! This is very inspiring. You’ve given me new ways to think out of the box (circle, block, etc!). I also have this dreaded affliction Kristi- I always think I can make it myself rather then buying it… if only I had endless time, I bet I could!! It was fun to see items that inspire you from your files and to hear how you would re-create the original. I’d love to see more of these posts in the future. You could do something like this once a month and have a catchy title for this style of post :-)! I would love that. I’ll love when your blog become something like that! I love the clay idea on the lamp and I’m seriously thinking about doing that. Great post! I love your vision and creativity! I enormously love this post, and your creativity! Keep inspiring the rest of us to be CREATIVE! You are amazingly kind women, not only giving us great DIY ideas every day, but also teaching us how you do it.